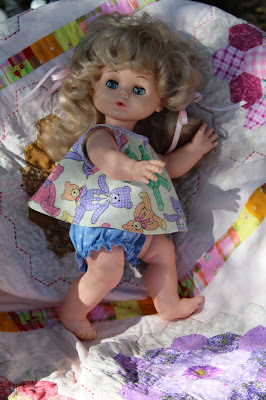 When I saw this lovely doll looking a bit worse for wear in a suburban op shop last year, I could not resist her. She was very grubby but otherwise in good nick. Her lashes have been trimmed a little and her left pigtail has had a bit of a trim too. As she has a lot of soft hair, you can't really notice it too much. Her hair is quite good quality and is lovely and soft. I made her a little bloomers and top outfit using one of my old patterns, and modified it to fit her. She is 15 inches high and I thought I could use the pattern for that size, but I had to upgrade her to the 20 inch doll size so that everything would fit her baby's stomach. She is a funny little doll with her abundant hair and a baby's body, but I love her anyway. Alas, I have too many dolls, so she is up for sale on etsy and ebay. I am making a hoodie at the moment using a KwikSew pattern and using a sweatshirt fabric with large cat's heads printed on a grey background. Sounds weird but I like it. I needed some hoodies to wear to the pool and just lounging about or down at the shops, and thought I would have a go at making some. Spotlight had a lot of this kind of fabric on sale recently, so I bought various prints to make 4 hoodies! I will do a show and tell soon. I wanted to make something in a stretch fabric as I have lost 3.1 kilos since the beginning of the year and don't want to make anything too fitted as I lose more weight. I have a fair bit more to lose but I already feel a lot better. We have had a hot and humid summer here in Australia and I have felt pretty uncomfortable so that was the final push I needed to have another go at losing some weight. Hope you are all well and happy stitching and doing dolly things. She's a little cutie! I like stretch fabrics (both for me and my dolls). You don't have to be so exact with it. She is lovely but no one bid on her so I have organised a whole lot of clothes and baby accessories and put them in a big pink box as a gift for my niece who is mad about baby dolls at the moment. The hoodie worked well by the way and i have another one cut out ready to sew. Thankgoodness for stretch fabric as i have lost another kilo.